This year's event will feature an egg roll, egg hunt, music stage, reading nook, egg dyeing, cookie decorating, card-making for troops, "Be Best" hopscotch, "Be Best" mail, musical eggs, costumed characters, tennis activities and many picture taking opportunities. There will also be a State Egg display on the Ellipse featuring designs from students across the nation. The Easter Egg Roll will be live-streamed from the South Lawn of the White House so people can follow along at home. 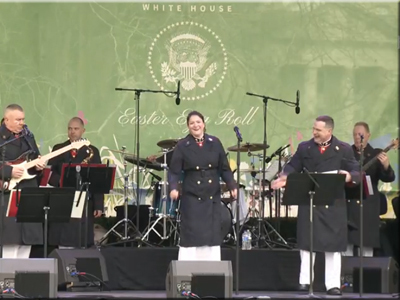 Military bands will perform on the Bunny Hop music stage throughout the day. 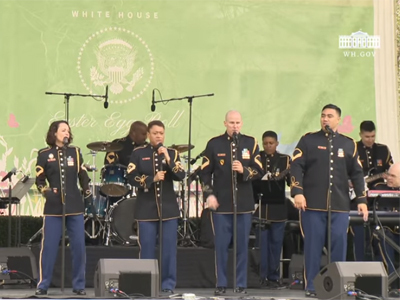 In addition to the bands below, the United States Army Old Guard Fife & Drum Corps will also perform. The 2019 White House commemorative Easter eggs are available for purchase here. The official souvenir wooden eggs are sold by the White House Historical Association. Easter Egg Roll tickets are free and were made available via an online lottery from Feb 28th thru March 4th. To enter the lottery, participants are prompted to create an account on the Recreation.gov website. The lottery page has a list of all of the available time slots and entrants rank them in the order of preference. 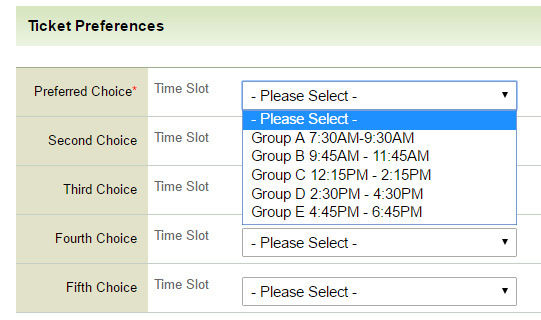 Entrants also specify the number of adults/children on the ticket request screen along with their time slot choices. Only one application per household is allowed. The @WHEasterEggRoll Twitter feed contains tweets from attendees, special guests, entertainers, volunteers, media and more. See more #EasterEggRoll photos on Instagram. 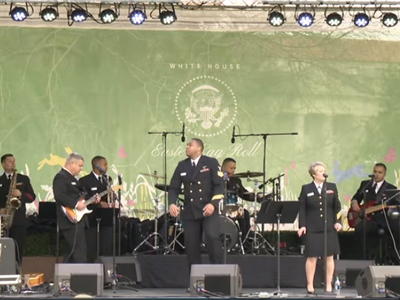 Watch these videos from the last year's White House Easter Egg Roll. The easiest way to get to the White House is by taking the Metro. The closest Metrorail stations to the White House are Federal Triangle (blue and orange lines), Metro Center (blue, orange, and red lines) and McPherson Square (blue and orange lines). If you do decide to drive, you can find nearby publicly available parking lots and garages here. 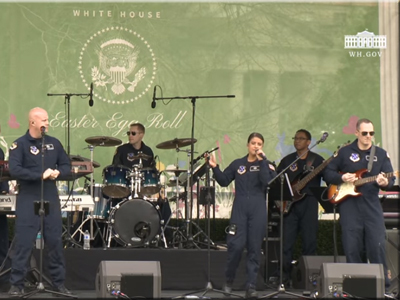 Each year, the White House puts out a call for Easter Egg Roll volunteers to assist with directions, ticketing, and crowd control. Volunteers must attend an orientation. Volunteer recruitment for the 2019 Easter Egg Roll took place in early March. Lottery ticket winners have come from all 50 states. A portion of the tickets are distributed to military families and public schools in Washington DC, Maryland and Virginia. On average, there are almost 50,000 lottery applicants requesting around 200,000 tickets in the lottery. The White House Easter Egg Roll ticket distribution method is via online lottery. The souvenir White House wooden eggs include the stamped signatures of the President and First Lady. The wooden eggs are made in the U.S. using a process of wood turning and barrel dying. Children receive a souvenir wooden egg at the event. More than 80,000 souvenir wooden eggs are made each year and have been available for public purchase. Over 14,000 hard-boiled eggs are hand-dyed for use in the Easter egg roll and the egg hunt. Guests at the Egg Dying station will decorate over 4,500 hard-boiled eggs on the day of the Easter Egg Roll. Visually impaired children are able to participate in the Egg Roll and Egg Hunt through the use of special “chirping eggs”. JDJ Fussyman, Diggy Simmons, Justin Timberlake, Lance Bass, Fifth Harmony, MKTO, Newsies, Jordin Sparks, Austin Mahone, Coco Jones, Sesame Street, and The Wanted have all performed on the Rockin’ Egg Roll Stage. ID4GiRLS and Jessica Sanchez have sung the National Anthem. Reading on the Storytime Stage: NASCAR’s Danica Patrick, Julianne Moore, J.K. Rowling, Minnesota Viking Adrian Peterson, Elmo, Abby, Gordon and Rosita from Sesame Street, the full cast of Super Sprowtz, The Wanted, and actress Quvenzhané Wallis. The White House uses goody bags that are made from recycled materials and can be recycled after use. The eggs are packaged in recyclable paperboard which minimizes waste and lessens the environmental impact of the event. There will be both trash bins and recycling bins for guests to use around the South Lawn and Ellipse areas. Event volunteers include professional American Sign Language interpreters and nurses and physicians from George Washington University. Each year, there are approximately 1,200 hard-working volunteers lending their time and talent to make the event a fun and memorable one. All volunteers are required to attend at least one training session. Many of the volunteers arrive early in the morning by 5:00 AM to help set up and get prepared for the first round of guest arrivals. It takes around 2,000 eggs to make breakfast for the hungry volunteers. The first White House Easter Egg Roll was held in 1878 when President Rutherford B. Hayes opened up the South Lawn to children who had been chased off the grounds of the U.S. Capitol. In 1933, the Easter Egg Roll was first broadcast to a national audience over the radio by Eleanor Roosevelt. There was a circus and petting zoo in 1977. President Nixon first invited the Easter Bunny to be part of the event and President Reagan started the tradition of the egg hunt. The last time the Easter Egg Roll was cancelled due to rain was in 2001.